Standard Palletising Cells | PAK Automation Ltd.
Small footprint, high speed palletising cells ideally suited for high volume, high repetition product lines, in a 3 or 2 shift environment. PAK Automation has developed a unique high speed palletising cell ideally suited for the Food Processing Industry, in particular for packing and palletising chilled/frozen products. 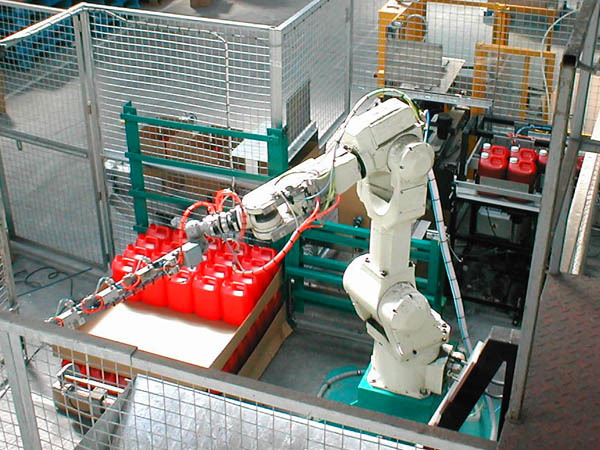 The system uses an industrial robot on a skid mount heavy duty base, supplied complete with a short infeed conveyor, and custom tooling to suit the product being handled. Sliding Doors enable the operator to take out the filled pallet and place in the new pallet. Two pallet build locations are in the cell and each side can be independently accessed whilst the robot continues to build on the opposite side. The system can handle layer sheets, and layer sheet locations can be provided on both sides of the system. Many companies are now embracing Robot Technology for the first time due to the ongoing need to reduce costs and increase efficiency. The Pak Automation Group continues to focus on Automation For Industry with the emphasis on delivering creative solutions with a short Payback period – often less than 14 months.